The Eastern Wyoming College Lancer Golf Team finished the McCook, Nebraska tournament with their second win of the season. The Lancers two-day total was 625 which was 14 strokes ahead of second place team McCook who finished at 639. Freshman Ryder Velasquez led the Lancers with a two-day total of 152. He finished 3rd in the individual standings. The Lancers will travel to Sterling, CO to compete in their annual tournament on September 10th and 11th. 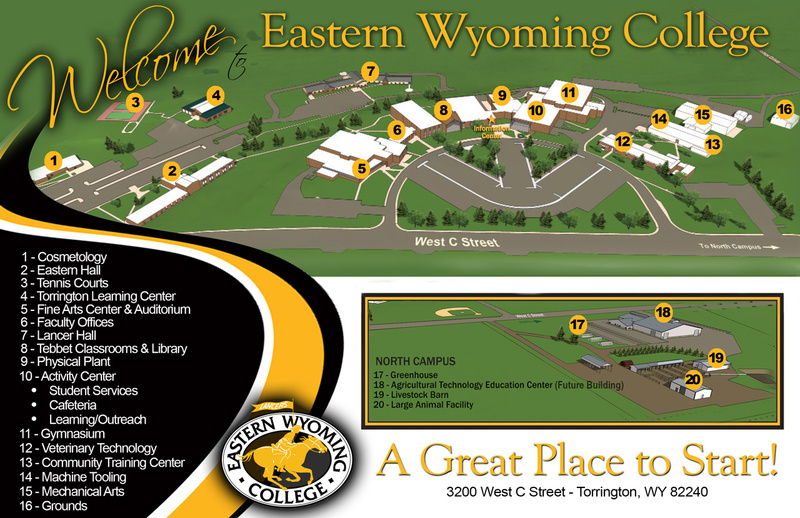 Eastern Wyoming College announces meet the Lancers on September 9th immediately following the volleyball game at 7 pm. The Lady Lancers will host Western Nebraska Community College. Please join us after the game for an autographed poster. The Eastern Wyoming Fine Arts Council in Torrington presents Michael Hurwitz & the Aimless Drifters Sunday, September 27 at 2:00 pm in the Fine Arts Auditorium in Torrington, Wyoming. Early Bird prices for this presentation are $15 for adults and students/children are $10. Prices at the door will be $20 for adults and $15 for students/children. Take a big helping of traditional cowboy music, stir in a little country honky-tonk and western swing, some southern blues and rockabilly, a bit of Louisiana Cajun, a taste of the high lonesome, add pinch of Mexican Norteno Accordion, and a spoonful of Hawaiian slack-key guitar and you’re getting close to the tasty gumbo of styles you’ll hear in the music of Michael Hurwitz. Born in Laramie, Wyoming Mike was initially influenced by the country and cowboy music he heard growing up in rural Wyoming. His Mother turned him on to the Southern country blues and jazz from her Mississippi home. Then years on the road, picking with anyone and everyone, and he absorbed many of the regional styles played in the different parts of the country that he traveled. For tickets for this presentation call the EWC Community Education office at 532-8213. Former EWC volleyball player and graduate McKayla Peterson, of Gillette, WY spent two weeks in Thailand helping animals and learning hands-on what it’s like to be a veterinarian. The group spent one week at the Elephant Nature Park in northern Thailand to work hands-on with the animals and learn about animal rescue and conservation on a larger scale. The Elephant Nature Park is home to over 40 elephants who have been rescued from trekking, logging, or forced breeding programs. Volunteers from all over the world feed, bathe, and care for elephants, as well as learning about their diagnoses alongside an elephant vet. The Elephant Nature Park is also home to over 400 dogs and 100 cats, as well as rabbits and water buffalo, and is sustained in huge part by the work of weekly volunteers like McKayla. The students spent their other week volunteering at the Animal Rescue Kingdom dog shelter in Chiang Mai, Thailand. The shelter is home to over 100 dogs who have been rescued after being abandoned, beaten, or abused. McKayla is continuing her education in Animal Science at the University of Wyoming. This trip was made possible by Loop Abroad. Loop Abroad has programs for students and young adults age 14 to 30, and offers financial aid and fundraising help to make their trips accessible to the greatest number of students. Interested participants can inquire or apply at www.LoopAbroad.com. The Eastern Wyoming College Lancer golf team season opened with a home tournament at Cottonwood at Torrington golf course. The Lancers won the two day tournament. The Lancers finished with a two-day total team score of 597, 23 strokes ahead of second place McCook Community College at 620. The Lancers were led by sophomore Logan Harrison, Cheyenne, WY, who finished the tournament in second place with a two-day total score of 145. The Lancers will compete in McCook, NE on September 3rd and 4th. The Community Education office at Eastern Wyoming College in Torrington has announced a correction for the Basic Self-Defense for Women. This class will be on held Thursday October 8 or November 5. The class will be held from 6:30-8:30 pm and the cost will be $20 a session.